The 2018 Easton Ghost X -11 USA is a godsend for many parents and junior baseball players who are unsure about which baseball bats are legal for them to use in their leagues. This comes with the new USA Baseball bat stamp, and that’s all you need to show Little League umpires that what you have in your hands is legal to use. But its appeal is more than that. It’s not just legal, it’s excellent too. The new rules may make it seem like every legal bat performs similarly, but you’ll find that the 2018 Easton Ghost X -11 USA baseball bat is different. In many ways, it’s a much better bat. This is legal to use in Little League, and also in AABC, Babe Ruth, Cal Ripken, Dixie Youth, and Pony baseball leagues. All you have to do is show the USA Baseball Stamp on the bat to the umpire when it’s your turn to bat, and you’re all set. There’s no long discussion about whether it meets the new standards. It looks quite striking, and its black color is very intimating. With the yellow accents, you get a look that will appeal to many young players. It also comes with a 2 5/8-inch barrel diameter. However, what many young kids will like is that it offers a drop -11 length to weight ratio. Again, you don’t have to check on the new rules to see if this is allowed. With the stamp, it certainly is legal to use. But now you have a truly lightweight bat for its length, ranging from 27 inches (16 ounces) to 31 inches (20 ounces). It’s a 1-piece bat made with composite material. More specifically, it’s made with Easton’s special Exact Carbon Composite material. This material enhances the barrel performance, and it sure gives you a huge sweet spot. That’s the area on the barrel that gives optimal impact on the ball when you swing and make contact. It’s also the area that the ball can hit without sending painful vibrations down the barrel of the bat that can sting your hands. This is enhanced with Easton baseball’s New Engineering X Advanced Carbon Technology. It’s not just the large area of the sweet spot that helps with the stinging vibrations. The bat also has what Easton calls its “New Engineering X Advanced Carbon Technology” to reduce the vibration. That should help, since as this is a 1-piece bat there’s not much else that can impede the vibrations from travelling freely down the length of the barrel. It does help that the handle is quite comfy to hold. It’s nice and thin at a diameter of just 29/32 of an inch. The composite handle feels easy to hold and to help with that you also have the famous 1.4mm HYPERSKIN Grip. This will offer amazing comfort for your hands when you grip the bat. It also ensures that you get a secure grip. After all, Hyperskin started as material for motocross handles. This comes with a balanced swing weight, which makes it easier to control than an end-loaded bat. Think of it as wielding a drum stick rather than a hammer. This is meant more for contact hitters. The material also offers excellent durability, and that’s always nice. It should last an entire season, and it also comes with a full 1-year warranty. This means that when you buy the 2018 Easton Ghost X Hyperlite, you won’t need to buy another one until the season ends. The most important bit here is that this is legal to use in Little League, as well as in the other leagues we’ve mentioned. That’s the big hurdle, since the new rules abandoned the old BBCOR standards. This means that your old BBCOR bats that you were planning to use aren’t going to be useful anymore for Little League play. Since many people seem confounded by the new standards, debates about legalities can get heated without the stamp of approval. Now you just have to show the USABat stamp to the umpire when you’re at the plate, and you’re good. That should keep the confusion to a minimum. This is legal to use. It may seem like it’s not legal, however, because it’s so light. That’s part of the benefits with the composite material used here. Most bats come in drop -10, and this gives you a bat that’s lighter than usual. Or in other words, you get an extra inch in barrel length when you get the bat that weighs just right for you. Since the bat is lightweight, this means that you can swing it very quickly. So you’re more able to catch up to fastballs. Also, you’re able to swing fast enough to generate more force. Given the 1-piece design of the bat, it’s stiffer and so the bat doesn’t have any sort of give. It will reflect the energy right back to the ball and it’ll go very quickly after making contact. There’s also something to be said about how easy it is to control. Again, that’s partly because of the light weight. But it’s also because of the balanced weight distribution. It’s easier to control than an end-loaded bat, and thus you’re able to swing right where you want in the strike zone. The massive sweet spot is of course a terrific benefit. It’s very similar to the 2018 DeMarini Voodoo USA bat. You won’t have to hit the ball just right. Just get the ball to hit in the huge sweet spot and the ball you hit can get going fast. Also, hitting the ball with the sweet spot on the barrel reduces the vibrations. It’s also quite comfy to hold, since the handle is slim and it’s covered in Hyperskin. There shouldn’t be any distractions when you hold it, so you’re not disadvantaged when you’re hitting. Of course, let’s not discount the fact that this looks utterly cool. The black and yellow colors work well together. You swing it, and the yellow streaks through the air like, well, a ghost. The colors, along with the material and the bat design, make you feel confident at the plate, and that should help your hitting. 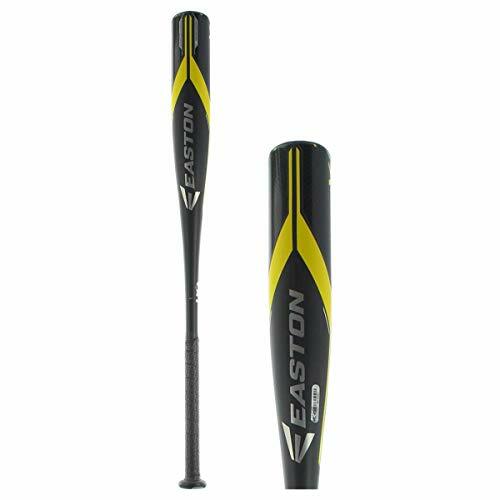 Parents may not like the 2018 Easton Ghost X Hyperlite -11 USA baseball bat, all that much, because it’s not exactly cheap. While in general 1-piece bats are more affordable, this one may be considered by some as a luxury. It’s true that some bats (especially 2-piece ones) can cost more, but it’s also true that many other bats cost a lot less than this one. Junior players may also be dismayed at how the vibrations can really sting. They’re not really fun at all. It’s true that this can help motivate you to hit more accurate with the large sweet spot. But it’s motivating with a large stick, and not with a nice carrot. All in all this is a strikingly effective bat for Little League players. It’s amazingly easy to control and comfortable to hold and swing quickly. Even its tendency towards punishing you with vibrations when you do wrong will help you become a better batter. Get the 2018 Easton Ghost X Hyperlite, and you’ll get more hits and drive in more runs. Want this 2018 Ghost X with Free shipping?